Located in Gold Beach Oregon on the famous Lower Rogue River, you'll find a destination for salmon and steelhead fishing enthusiasts from all over the world. Your fishing memories will last a lifetime! You'll find the Rogue River to be one of the best salmon and steelhead fishing rivers in the world making them a thrill to catch as well as top notch table fare. You will experience outstanding year-round salmon and steelhead opportunities on the Rogue, Elk, Sixes, Chetco, and Umpqua rivers in boats built for comfort and class. Rogue Coast Sport Fishing's permit allows access from bay to the wild and scenic section of the Rogue (to Blossom Bar). Only seven guides hold this exclusive permit. Joe Martin is a fourth generation Agness native who grew up where the Illinois River joins the Rogue. He is passionate about the local waters and has spent his childhood mastering the local waters he calls home. He graduated from Gold Beach High School in 1988 and moved to Whidbey Island to attend the Marine Tech program at Skagit Valley Community College. Upon completion of that program, he was hired at Waterfall Resort in Southeast Alaska as a Marine Mechanic. 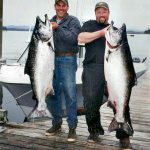 After a few years there, he decided to pursue his Coast Guard license to become a Guide and began guiding for prestigious resorts in Southeast Alaska, fishing for salmon and halibut in 1997. Joe was a top requested guide in Southeast Alaska for both customer service and catching success. Joe has spent every spare opportunity over the past 27 years to come home to fish with friends and family on the Rogue, Illinois, Sixes, and Elk. This Fall, Joe had the opportunity to permanently relocate to the waters he holds dearest and return home to Agness. He knows the local waters as well as anyone and comes highly recommended. Joe has always had an uncanny knack for understanding the fish's psychology and, if anyone can find and catch one that day, it will be Joe. He will offer drift boat trips on all local waters as well as jet boat trips in his 25 foot custom equipped Willie Classic boat on the Rogue. Rogue Coast Sport Fishing offers only top-notch service and you will not be disappointed. Joe not only knows every fishing hole on the waters, he knows the history of the peoples and the legends of the area. Joe is also a skilled fly fisherman and would like the opportunity to introduce the flyfisher to the waters he calls home. Joe is CPR/First Aide Certified, holds a 25-Ton Coast Guard license since 1997, is Oregon State Marine Board Certified, and holds one of only seven permits to guide upriver to Blossom Bar. From late March through June, you'll find the Rogue River to be one of the best Spring Chinook Salmon fishing rivers in the world. You'll not only have great runs of Spring Chinook Salmon but will find they are caught only hours out of the ocean - making them the best eating Spring Chinook Salmon to be found. These fish are the most sought-after salmon there are. They are known for their extremely hard fight and for their wonderful flavor when broiled or barbecued. The Spring Salmon range from 16 to 45 pounds with an average weight being about 22 pounds. You will start fishing very early in the morning and call it a day when you are ready to call it a day....you set the schedule! We can comfortably take up to four anglers in each boat. With the Rogue River supporting the most healthy run in the Pacific Northwest, this is a very busy time for Joe. You'll use a covered / heated 25 foot jet boat for these fish and be provided a hot breakfast on board. The boat is top-of-the-line and has all the comforts needed. Fall Chinook fishing can be enjoyed from July through December and starts with trolling the estuaries of the Rogue, Coquille, and Coos rivers. As fish move into the rivers, we will follow the migration with the jet boat. This often overlaps with summer steelhead and is a great time to be on the river. In November and December, Fall Chinook fishing is done on the Elk and Sixes rivers when the rains have flushed out the estuaries. We use a 17 foot Willie drift boat for this experience. Gold Beach Oregon is the home to Rogue River Fall Chinook Salmon fishing. Rogue River Fall Chinook run large and very fresh from the sea. 23 pound to 30 pound Fall Chinook are most common here on the Lower Rogue River, although in recent years there have been Rogue River Fall Chinook of 66 pounds and one that broke the World Record for Fly Fishing at 71.5 pounds in 2002! Nearly all of the Rogue River Salmon fishing is for wild salmon stocks - very few hatchery Fall King Salmon are found in the Rogue River. Salmon fishing is good here until mid to late October. In November and December you'll still find Fall Chinook Salmon in the end of the season. These big bruisers enter the smaller streams after the first fall rains. December boasts the coast's last opportunity of the year for Chinook. The Sixes and Elk Rivers offer phenomenal opportunities to catch these often large Fall Chinook. They can average in the 30 pound class with some weighing even more. To catch fish of this size from a 17 foot Willie drift boat powered only by oars - fish which are swimming in a small, fast river - can be a real challenge, even for the most skilled fisherman. This will be a memorable trip! These salmon are fished for in the Fall. They are caught in both the bay and river, are eager biters and hard fighters, and make for great sport. This fishing makes for one of the most peaceful river experiences with little crowd and great Fall weather. Fishing can be done with fly or spinning gear and this is one of my favorite times to fish. The Rogue River boasts of one of the largest runs of Coho Salmon (Silvers). You will fish these beauties with light trolling gear or light spinning tackle and spinners. Coho usually run from 6 to 12 pounds and typically give you a work out. We invite you to fish all Southern Oregon Rivers for Steelhead with Rogue Coast Sport Fishing! Summer Steelhead are in the Rogue River. These great fish we like to call "half pounders" were named by Zane Gray back in the 1930's and are hard fighting fish. These Summer Steelhead range from 2 to 5 pounds and take a fly very aggressively. We also use light conventional tackle. Normally you will have lots of action fishing for these sea run rainbows this time of year. Coupled with the great fall weather, you have the makings for a very enjoyable outdoor adventure! Summer Steelhead are aggressive biters making them fun for all experience levels. They enter the river in mid to late July and can be fished with fly or spinning tackle. Winter Steelhead season runs December through March. Joe's permit allows you to access the beautiful roadless section of the Rogue and, when combined with holdover Summer Stealhead, they make a dream experience for the flyfisher on the Rogue. Coastal rivers will be fished with a drift boat for Steelhead. 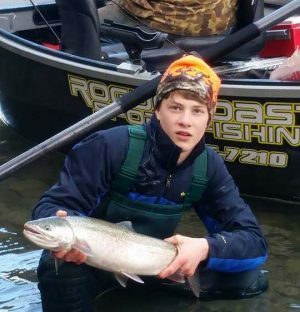 Rogue River Winter Steelhead fishing is done in powerboats. Winter Steelhead here are numerous and aggressive. With our decades of Rogue River Steelhead fishing experience, your day with us will be comfortable and productive. Winter Steelhead fishing on the smaller coastal rivers in Southern Oregon is done in a 17' Willie drift boat (no motor). You will experience peaceful and beautiful days fishing for Winter Steelhead on wonderful small rivers - done the historic way..! Your Rogue River Fishing Guide Joe Martin is a steelhead "junkie/enthusiast" and takes guests to the Steelhead havens of the Elk River, Sixes River, and Chetco River. Flyfishing for Summer and Winter Steelhead makes for a great sport. The Rogue River has a long history of flyfishing. Our Winter Steelhead combined with holdover Summer Steelhead makes for an unmatched sport and experience. Again, Rogue Coast Sport Fishing’s permit to the Wild and Scenic section of the Rogue allows you to fish nearly untouched waters and enjoy unparalleled beauty. Your snacks and drinks are welcome on board!